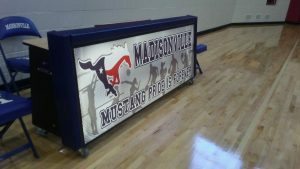 Sideline Interactive’s Premium All Metal Backlit Scorers Table can withstand abuse and kids standing on the table. Our Premium All Metal Scoring Table is made TEXAS TOUGH. Using our all steel frame and body with long last LED lights and shatterproof polycarbonate artwork screens, our PREMIUM BACKLIT SCORING TABLE will outlast your gym! Our PREMIUM BACKLIT SCORING TABLE is the only upgradeable scoring table in the market. 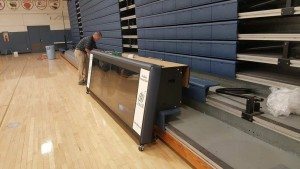 With patented system, you can upgrade the PREMIUM BACKLIT SCORING TABLE into a Digital Scoring Table or LED Scoring Table without having to purchase a new scorers table. The Backlit scoring table can be combined and tied into our Interactive Digital Scorer’s Table or LED Scorer’s Table to form an unlimited length. Comes with an EXCLUSIVE 10 YEAR WARRANTY! * contact us for warranty details.